Lake, Geneva, WI – Children’s World Impact would like to thank FORM Wealth of Lake Geneva, for their organization and support of the 2017 CWI Food Packaging Event. On Friday, March 17 and Saturday, March 18, close to 800 volunteers showed up at Lakeland Community Church to package 100,000 meals that will go to feed orphans in southern Africa who suffer from food insecurity. The FORM Wealth team, headed by Tyson Ray, worked in collaboration with Children’s World Impact (CWI) and Lakeland Community Church to host the ninth major food-packaging event sponsored by CWI. In total, this organization has packed over 1,100,000 meals that have fed hungry children and families around the globe, as well as local families through Walworth County food pantries. Lakeland Community Church, through their Multiply! initiative, raised $25,000 to fund the materials for the food packaging event. Kids Around the World, of Rockford, IL, supplied all the components of the meals, which consist of soy and rice fortified with 21 vitamins and minerals, seasoning, and 6 different dehydrated vegetables. In addition to feeding hungry children, the nutrient rich formula actually reverses the starvation process and its effects. The meals packaged at Lakeland Community Church will be sent to Swaziland in Southern Africa to feed orphans. CWI wishes to thank the congregation of Lakeland Community Church for their financial support of this event. Without their generous giving, this event would not have been possible. CWI thanks FORM Wealth for their organizational input in structuring the event. Their teamwork was essential for a successful event. In addition, CWI would like to thank the hundreds and hundreds of volunteers who showed up to package the meals. Their energy was palpable and the time they dedicated to making an impact will be felt halfway around the world for many months to come. 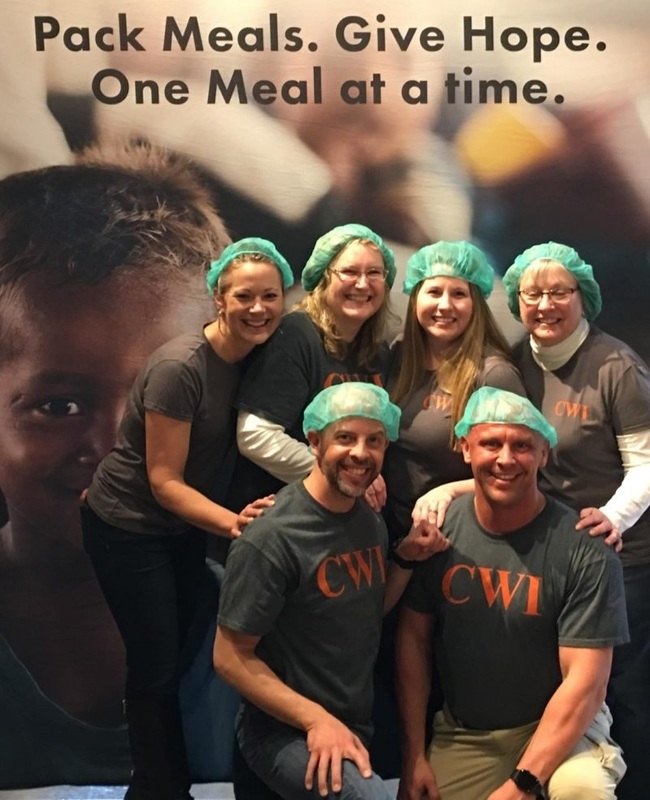 FORM Wealth, Branch AJI – Lake Geneva, Wisconsin – volunteers for Children’s World Impact Food Packaging Event, packaging 100,000 meals to be sent to south Africa.